Suka is proud to announce that four of our recent web projects were recognized by the Web Marketing Association’s 2017 WebAwards. Read more about each project below, and click the links to see our sites in action. National Philanthropic Trust (NPT) turned to Suka for help in reimagining a web-based timeline that showcased the long-standing history of philanthropic giving dating back over 500 years. The previous iteration of the site was static and uninspired, providing little to no context for the various entries on the timeline. NPT wanted to create a fully immersive, interactive, and responsive experience that would inspire curiosity and interest in the history of philanthropy and demonstrate philanthropy’s global impact throughout history. 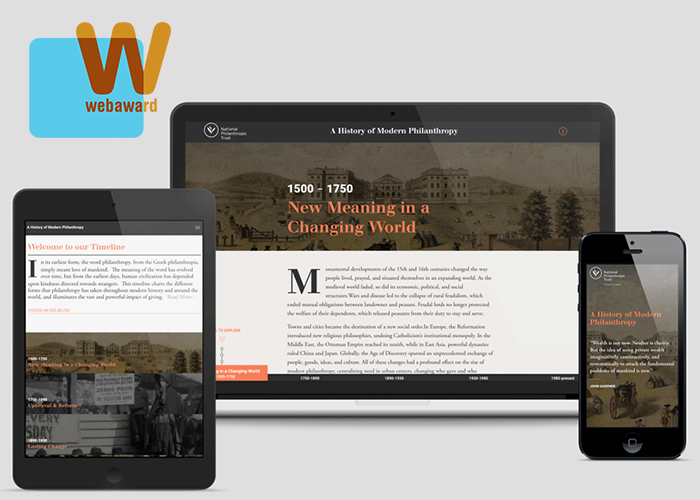 We designed an experience that allows users to explore and engage with the history of philanthropy through various entry points based on their interests. To articulate the global story, each point on the timeline aligns with a location on a map so that users are able to see the growth of philanthropy around the world as they explore the site. Bolstered by client-curated historical content and media assets dating from the 1500s to the present, the new site delivers a dynamic educational resource. The Pollock-Krasner Foundation (PKF) came to Suka to redesign their website. Their former website was dated, difficult to navigate, and very unclear on the process for applying for a grant or even what grants were available. PKF wanted to redefine their website experience to help clarify their content, educate artists on the grants offered and the application process, and increase engagement. The new site features archive images of Jackson Pollock and Lee Krasner, evoking the Foundation’s mission and providing the missing connection to the Foundation’s namesakes. To clarify the grant application process, Suka designed a step-by-step walk-through with clear explanations and a series of frequently asked questions. Additionally, the website showcases the work of past grant recipients, highlighting PKF’s mission to empower artists and inspiring them to apply. The Community Preservation Corporation (CPC), a nonprofit mortgage lender, emerged from an internal reorganization with renewed strength and vigor. To help differentiate themselves amid growing competition from commercial banks and other lenders, CPC engaged Suka to develop new messaging, a new brand identity, and a redesigned website that would both capture the history of the organization and embody its new direction. Our discovery and research process uncovered the human impact of CPC’s work. Through photography choices, data presentation, and case studies, the new website’s experience brings this identity to the forefront by illustrating the effect of CPC’s work in the communities they serve. Combining these elements with a modern, softer, and more approachable design, we created a look that aligned with CPC’s new, forward-thinking mentality. In addition, subtle loading animations give the site a sense of vitality. The New York State Technology Enterprise Corporation (NYSTEC) website no longer reflected the organization’s esteemed reputation and proficiency as a technology consulting company. NYSTEC wanted a new website that showcased the organization’s vast expertise, not only through the content but also through the design. We designed and developed a responsive, mobile-friendly website for NYSTEC that is accessible across desktop, smartphone, and tablet devices. We performed competitive research and defined user goals and user flows to improve several aspects of the site: information architecture, site navigation, user experience, and visual design. The new website now reflects NYSTEC’s mission, capabilities, and company culture, instrumental in growing NYSTEC’s brand.